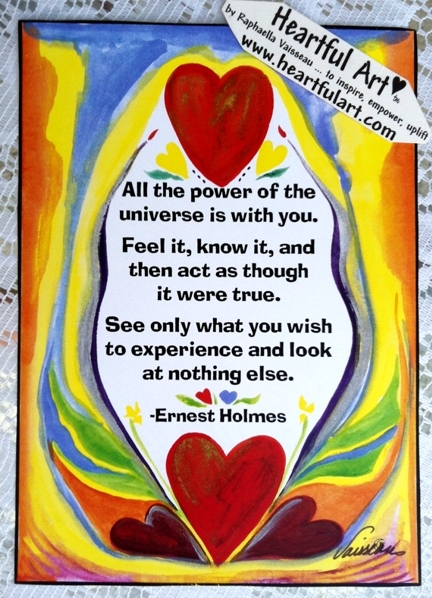 "All of the power of the universe is with you ..." 5x7 poster of a law of attraction quote by Ernest Holmes with art by Raphaella Vaisseau. Ernest Holmes is the founder of the New Thought Church of Religious Science and the Centers for Spiritual Living. This law of attraction poster is a motivational reminder of how important it is to remember you are not alone. Walk out into the world, look up, and acknowledge the presence of spirit is with you. Keep that awareness throughout the day and focus on the good in your life, in others, and in the world around you. The universe is powerful and you have access to it. Be confident. Keep the faith. Practice the universal Law of Attraction and watch life unfold according to your thoughts and beliefs. Know you are not alone. Feel joy and happiness at living. Look for the good. Focus on what you want more of. Watch what happens.